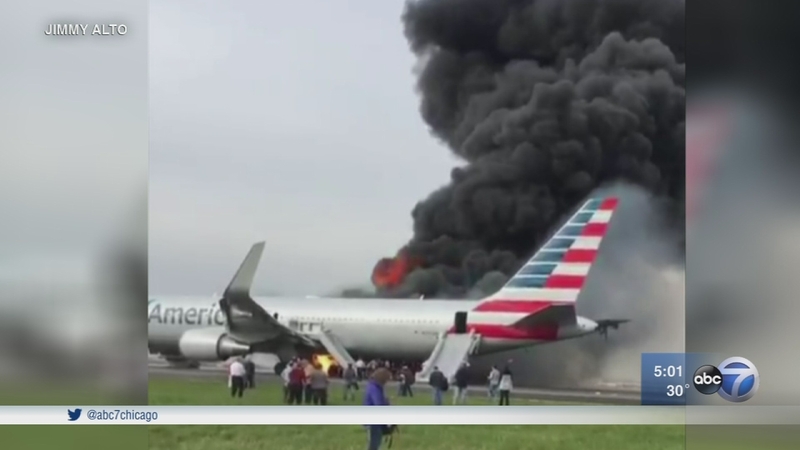 CHICAGO -- A number of passengers aboard an American Airlines flight that caught fire at Chicago's O'Hare International Airport in 2016 refused to leave behind their carry-on bags in one of four incidents in the past several years in which an evacuation was hampered by travelers grabbing carry-on luggage, according to the National Transportation Safety Board. The NTSB recently completed its investigation into the October 2016 fire aboard the jetliner, blaming it on an engine problem - microscopic "fatigue" cracks in a turbine disk caused it to break apart at incredible velocity, piercing a fuel line and tank and igniting one side of the aircraft, the Chicago Sun-Times reported . The NTSB is asking the Federal Aviation Administration to look into the luggage issue and whether anything can be done to discourage passengers from trying to grab carry-on bags during emergencies. The fire began before the Miami-bound plane had taken off from O'Hare. Although flames were visible to many passengers and smoke was pouring in, some people insisted on retrieving their carry-on bags from overhead compartments, according to federal records showing post-incident interviews with flight attendants. One person was seriously hurt and 20 others suffered minor injuries. Robert Sumwalt, chairman of the NTSB, told the Sun-Times that it's worth exploring whether passengers who refuse to leave behind their bags should be fined. He said that's up to the FAA to decide. "I have thought about that," Sumwalt said. "People might be less inclined to worry about all their Gucci luggage." The NTSB is asking the FAA to conduct research to "measure and evaluate the effects of carry-on baggage on passenger deplaning times and safety during an emergency evacuation." It's also recommending that the FAA "identify effective countermeasures to reduce any determined risks, and implement the countermeasures." The issue also came up after during the evacuation of a United Airlines flight that had slid from an O'Hare runway in January 2016, records show. The captain and flight attendants told passengers to leave luggage, but several people argued, and didn't listen, according to records. A spokesman for the FAA declined to comment on the luggage issue, saying the NTSB's recommendations and findings will be reviewed. Sara Nelson, president of the Association of Flight Attendants, said the FAA "should use existing laws to crack down on passengers endangering themselves and countless others as they put computers, cosmetics and clothing ahead of human life." The FAA has sought civil penalties against more than 150 passengers in the past five years for interfering with a flight crew, an agency official said. However, it's unclear whether any of those incidents involved baggage.